Horror and comedy were two genres I wasn’t always keen on mixing. Over the years with movies such as SHAUN OF THE DEAD and LESBIAN VAMPIRE KILLERS, however, I’ve slowly gone from skeptic to outright fan. Needless to say, I was delighted when actor, David Fultz, found me on Facebook and introduced me to the latest project he was involved in – MY BLOODY WEDDING! A blushing bride-to-be decides to honor the marriage ritual of adding “something borrowed” to her wedding day. Unfortunately, this is in the form of jewelry worn by a cursed ancestor. As a result the bride, and members of her bridal party, are transformed into blood-thirsty demons. The film was shot on a paltry budget of $15,000 over 11 days. This should not imply, however, that it scrimps on the laughs. Interestingly enough, the director and star both share the same name…Morgan Mead! The both co-wrote the script and Mean the actress stars as the blood-spattered bride, Callista DeFord. I have to say that in the numerous vampire/demon themed films I’ve seen, never have I witnessed a more bubbly and likeable antagonist such as Callista. This makes it all the more amusing as she nonchalantly begins racking up the body count! Patrick Babbitt plays the nervous groom, Doug Shephard, whose trepidation over his fiance’s new found blood-lust is matched only by his fear of “going all the way.” This is despite the uncomfortable pep talk given by his parents at the breakfast table and, later, their even more disconcerting “home-made” instructional video. The repressed momma’s boy is constantly seeking (and dismissing) advice from his neurotic friend, Steve (Kyle S. More). He is also joined by his robot (yes, I said robot) and Callista’s neighbor – a hefty wrestling fan who is extremely funny and likeable. 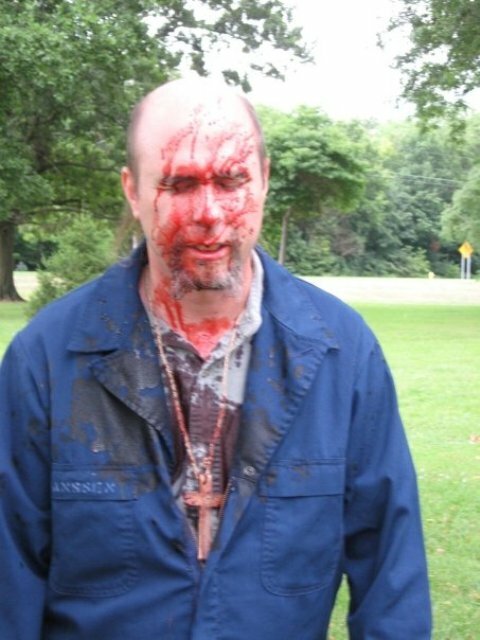 David Fultz portrays the deranged demon killer, Clyde, who routinely gets doused with buckets of blood. He and all the characters come together for the films climax (the wedding of course) where they must not only deal with the demon possessed bridal party but a legion of undead, wedding guests as well. All in all, this film was a lot of fun and the wedding infinitely more entertaining to watch than the one that recently took place in England. The film has been released TODAY and can be purchased via Amazon and Fryes.com. 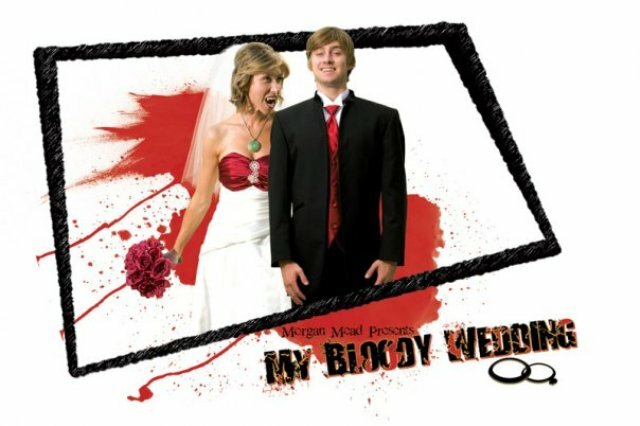 If you’re looking for a lot of laughs and a bit of gore, then say “I Do” to MY BLOODY WEDDING! This entry was posted in Movie Reviews and tagged Callista DeFord, David Fultz, Independent Horror Films, Lesbian Vampire Killers, Morgan Mead, MY BLOODY WEDDING, SHAUN OF THE DEAD. Bookmark the permalink. ← Meeting Barbara Steele at Horrorhound Weekend! I feel in the horror movie genre there should be more comedy/ horror flicks. Ever see that western zombie film with Chris Cattan? That was funny. I just don’t want to see 10 million copies of Shaun Of The Dead. Troma films have really ruled this sub-genre that they are seen more as comedies than horror flicks. Boy Dave, ya made Svenster mailbag segment twice in two years! I don’t know how you do it…..